Arrive in Istanbul. Meet and transfer to the hotel. 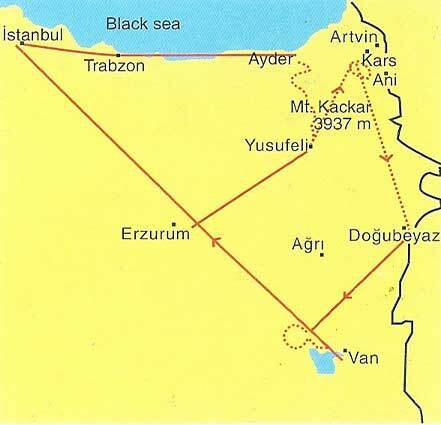 In the morning transfer to the airport and fly to Erzurum is the hub of eastern Anatolia, and has been an important center of civilization for centuries because of its natural and geo strategic position. Drive to Yusufeli village close to Coruh river. Possibility to make a tour in the village to see local life. Our minibus will take us to Yaylalar village where the villagers did not change their life style for centuries. Overnight camp 2100m. We trek to through the main Kackar range. The scenery of the region is most impressive, green valleys lush with vegetation and rich with wild flowers. Continue trek to Dilberduzu. Today we pass the yaylas that the villagers inhabit during the summer in order to graze their flocks. On our way will visit the nomad’s camps and lunch will be taken in a local village. Fields of yellow line the streams that the trail follows to the camp site. 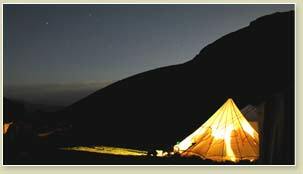 The camp site is by a stream and has magnificent views of the steep snowcapped majestic mountains that surrounded it . (6 hrs.). Overnight camp. Free day to enjoy the scenery and unique setting, or for optional walks in the area. You may take the opportunity to ascend Mount Kackar (3937 m). The view at the top, however, offer a magnificent reward with a vista to the Caucasus and mount Ararat. Enroute , we pass the cold and refreshing Deniz lake. Return to camp of Dilberduzu (2600m). 8 h. Overnight at camp with all meals. Ascent 1337 m, descent 1337m. we head for Hevek village where visit the local people and take our last picnic. On the way the scenery is spectacular and the magnificent wild flora is the gift of this days. From here we transfer to Yusufeli Village, is at the corner of Coruh river, passing by tea plantations into the mountains . Descent 500m.. Overnight at pension. Continue driving along the Tortum Valley to Erzurum. is the hub of eastern Anatolia, and has been an important center of civilization for centuries because of its natural and geostrategic position. After lunch, we visit Cifteminareli Medrese, built by the Seljuk sultan Aladdin in 1253, Ulu mosque built in 1179, has an unusual form with seven wide naves. Drive to Dogubeyazit. 5h. driving . Dinner at Local Restaurant. Overnight at hotel. In the morning transfer to Cevirme Village (2350m). Trek to the base camp at 2.900m, about five hours trekking. Dinner and overnight at camp. Trek to camp II (4. lOOm), about 4 hours trekking time. Return to camp 1. Free time for preparation. Dinner and Overnight Camp. Trek to camp I (4. lOOm), about 4/5 hours trekking time. All luggage will be carried by pack animals. 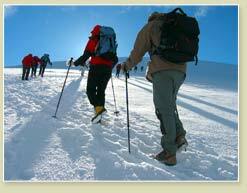 A short course will be given on how to use ice-axe and crampons. Overnight camp with all meals. Climb to the summit ( 5.165m) , Although it is not a technically difficult climb, it does require stamina. Our ascension starts early in the morning. About at 4500 m glaciers and perennial snows are present, thus the most part of the ascent is done with equipment necessary for ice climbing. 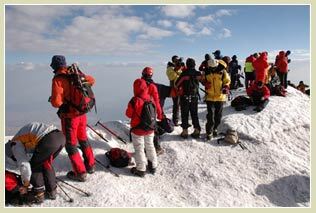 Anybody fit for high mountain walking or acquainted with ice climbing. Return to the base Camp I. Overnight at camp, with all meals. 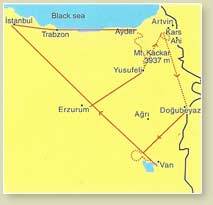 Descend to Cevirme Village about 5 hours and return to Dogubeyazit by minibus. Visit the Ishakpasa Palace 17th century ottoman governor of the province, constructed the palace in the 17th century with a mixture of architectural styles. And nearby we will also visit bas-relief of an Urartian King, and a rock tomb from the 9th century B.C. Dinner at the Local Restaurant . overnight in hotel. In the morning, drive to Van. (2h) Arriving and excursion to the 10th century holy cross church located on Akdamar Island. On the island stands the 10th-century Church of the Holy Cross, Architect monk Manuel built the church between the years 915 and 921.The Church, consecrated in honor of the holy cross. Free time for swimming. Visit the 17th century ottoman castle at Hosap and the ruins of Urartian city (765B.C) at Cavustepe. Then driving for watching the sunset over Van lake. Dinner at local restaurant . Overnight Hotel. Transfer to the airport and fly to Istanbul. Afternoon will be spent by visiting the old Istanbul, was known until the First World War as Constantinople, the old capital of the Byzantine and Ottoman Empires. Nearly all the city’s main sites of historic interest are in old Stamboul. We include a half-day walking tour of the city, taking in the Blue mosque and the hippodrome. The covered bazaar is not far away and is well worth a visit. Free day for further sightseeing. Overnight Hotel .